In an effort to reduce the number of dryer fires (over 15,500 per year in the US alone) most building code has strict guidelines for properly venting a dryer. Every foot of duct run reduces airflow efficiency and small radius elbows have an even greater impact. The Dryer-Ell was specifically designed to eliminate that impact. Calling on ASHRAE engineering fundamentals, it's built with a smooth interior and sweeping radius that improve airflow efficiency. UL found it to be 500% more efficient than sectioned elbows. Today, ten inch radius elbows are written into both International Residential Code and International Mechanical Code. 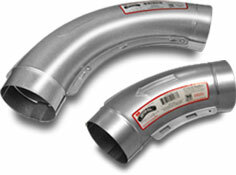 You may click on the links below for a printable version of the section affecting dryer ducting. More detail on how it got added follows. Different municipalities adopt code revisions at different rates, so it's important to have a history of Dryer-Ell adoption. This will help you to be certain you have the right supporting detail for the local inspector. As mentioned above the Dryer-Ell was designed within the framework of ASHRAE fundamentals to have the same affect on air flow rate as straight pipe. From there, Underwriters Laboratories confirmed the Dryer-Ell's improved airflow efficiency in 2006. The International Code Council later allowed the Dryer-Ell to be measured using ASHRAE methodology in 2006 Residential Code which translates to a one-to-one ratio when comparing friction loss versus straight pipe. 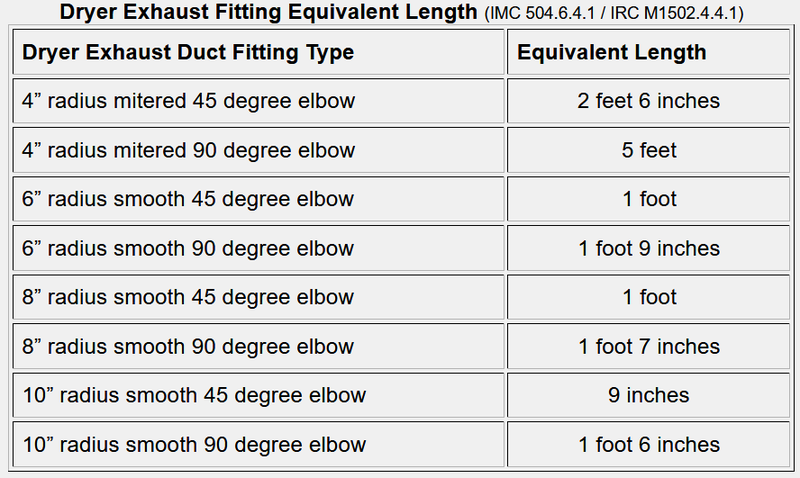 For 2009, ICC published tables that clearly delineate the fact the Dryer-Ell is measured the same as straight pipe in both International Residential and International Mechanical Codes. For quick reference, here is the pertinent table showing the equivalent length of various elbows. You will note that the equivalent length for ten inch radius, smooth elbows matches the lengths of each model Dryer-Ell.